I’ve been on a painting spree recently, trying to get my Dark Elves painted before the end of the year. I’ve also realised that this is a bit of a long shot, but it won’t stop me trying! I’m one of these people who appreciates the skill of someone doing a great job (as Dave mentioned last week), but I just have to do it myself. My painting method is to take all the models of a particular type or unit, and do them as one enormous batch. There’s normally two or three different groups, at various stages, all nicely arranged and separated by paint pots to show what I need to do next. When painting a Wood Elf army in one go, this meant 48 archers in my mega-batch (some were halfway done while others were still being assembled!) and currently, I have about 60 corsairs. It’s a bit daunting at first, but it’s nice to see them all progress along slowly, then at the end the final details go on incredibly quickly – usually a tiny spot of colour on each model, and a dozen can be finished in a few minutes. The satisfaction as they are all finished together is brilliant, and because I do them all together they are all almost identical in quality and style. Because of this, I tend to follow other people’s guides (often Games Workshop) on how certain things should be done, if I like their style of (for example) sea dragon cloaks, and I’ve not painted something like that before. I’m not confident about my ability to pick colours well, and I’m definitely not sure about which paints to use to produce a certain layering effect, or what base paint for a certain output. This brings us, via the scenic route, to a new tool I’ve discovered recently – the Silicon Dragons Color Match 1.0 (and I’m aware of the spelling, it hurts me too) (EDIT six years later, it no longer exists. Boooooo). By following guides by Games Workshop, I will only be told what Games Workshop paints I need. I’ve got some colours that have been discontinued, renamed or replaced over time and if I can help it I’d rather use something I already have than buy a new shade of brown, when I have five or six sitting there almost full. I also look at other paint ranges that are cheaper, and wonder if any of their colours match the ones the guide tells me to use. The Colour Match tool from Silicon Dragons is free, and allows you to match two different paint lines to see what paints from one company match the paints of another one. In many cases, it’ll show several possible candidates and you can eyeball a match and say ‘well, it’s a little less red than I need, but I can mix that up.’ Even better, some shades (but less than I expected) are dead on exact, and a good shot to replace a more expensive line with a cheaper one. The match data is collected from volunteers across the world, anyone is free to post in a sample to be incorporated into the tool’s database as long as they follow certain guides. This helps take an average of batches which may leave the factories in identical pots but have a slightly different composition. It all gets a bit technical for me. The only ‘gotcha’ I found when using it (although it appears to have more options now I go for a screenshot!) was that I had to research the paint lines I looked at to tell whether or not they were for air paint spray gadgets. I found uncertain advice that they should be OK for regular brush painting, but were pre-thinned for the spray application so possibly less strong a colour? I couldn’t really tell. 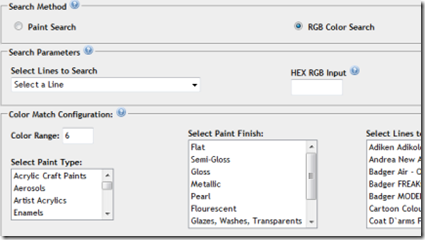 Regardless, this is a great tool for frugal painting, since it is free (frugal already!) and can help find a cheaper alternative to recommended paints if you, like me, are slavishly following someone else’s recipe. It’s also a great tool for frugal gaming, since it will help encourage painting and painted models always outperform unpainted ones. The dice can tell.